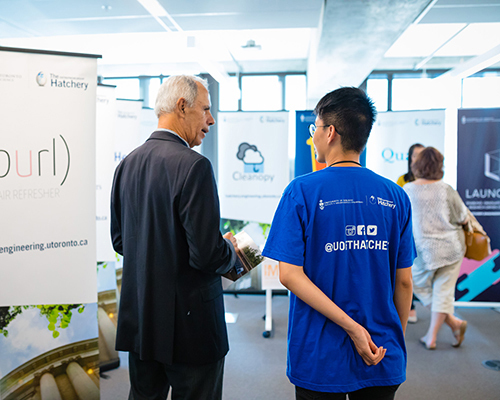 Nine floors filled with interactive exhibits made for a fully immersive experience for more than 500 members of the U of T Engineering community at the Myhal Centre Open House, held on Sept. 13. The experiential event enabled faculty, staff, students, alumni and friends to engage with the state-of-the-art facilities, learning spaces, institutes and centres housed in the new Myhal Centre for Engineering Innovation & Entrepreneurship. Dean Amon, alongside Engineering Society president Shivani Nathoo (Year 4 EngSci + PEY) and Professor Emeritus Ron Venter, chair of the building planning committee, launched the celebration with a countdown to the official unveiling of the Engineering Society Arena, located on Level 0. 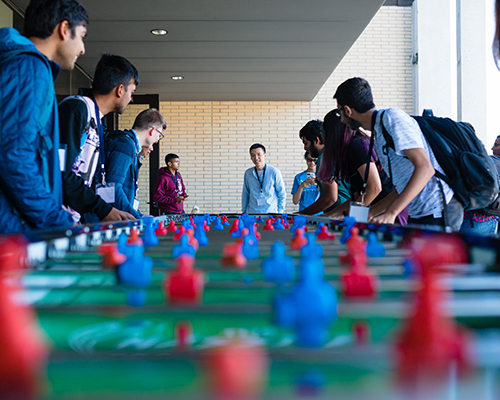 The Skule™ Arena is designed to support the rich variety of more than 100 co-curricular clubs and teams that enhance U of T Engineering’s vibrant community. 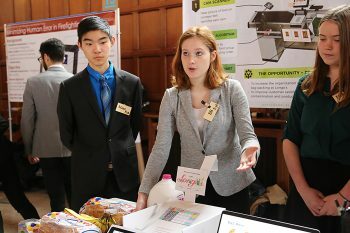 The Arena is the new home for many of U of T Engineering’s student clubs, including the Supermileage Team, U of T Aerospace Team and the U of T Robotics Association, who all showcased their work at the Open House. 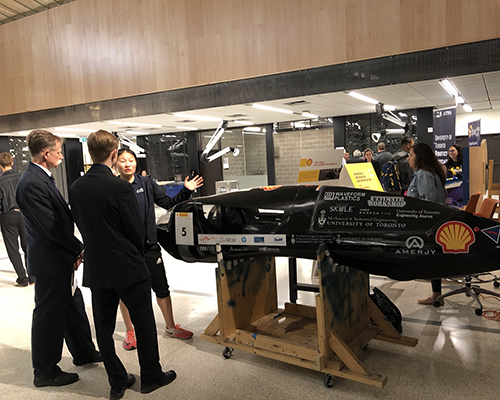 The newly unveiled Engineering Society Arena was where attendees got to meet ambassadors from the Supermileage Team, U of T Aerospace Team (UTAT), U of T Robotics Association (UTRA) and the U of T Seismic Design Team (UTSD). The student clubs showcased their record-breaking vehicles and innovative projects. U of T Engineering’s impact and network encompasses the globe. 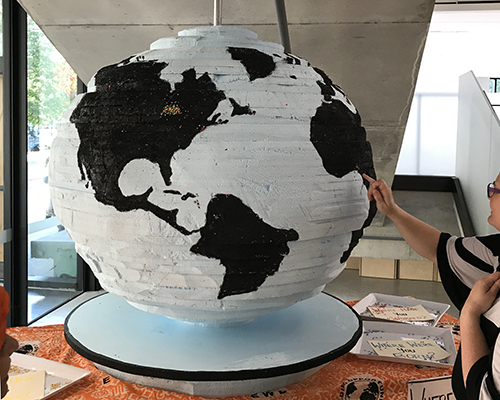 That’s why U of T’s Chapter of Engineers Without Borders and the Blue & Gold Committee invited visitors to chart their connections to countries worldwide on a giant map, demonstrating the Faculty’s international reach in a participatory and highly visual presentation. How much drinking water (in litres) does the City of Toronto process each day? 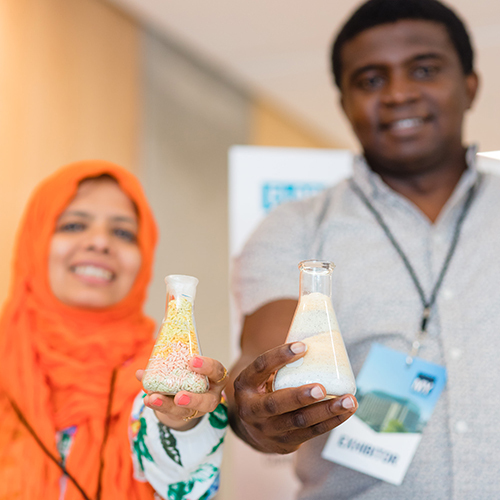 The Institutes for Water Innovation (IWI) and Sustainable Energy (ISE) challenged visitors to compete to see who knew most about water and sustainable energy research – gameshow style. 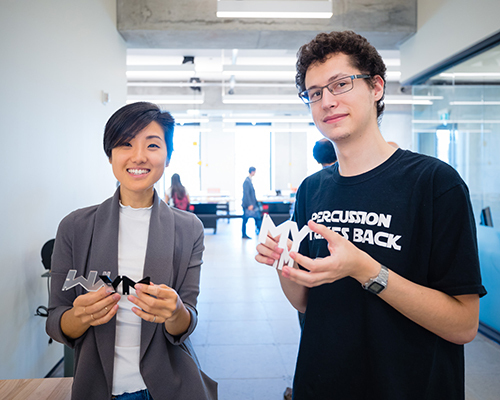 Any design project — whether it is part of a course, a co-curricular activity, or a student-led startup company — is greatly enhanced by access to the advanced equipment required to build and test prototypes. That’s why prototyping facilities occupy a large portion of Level 4 of the Myhal Centre. This floor includes a supervised rapid-prototyping room with powerful multi-material/composite materials 3D printers and other fabrication equipment. The prototyping room is surrounded by design studios, allowing teams of students to move rapidly between model construction and planning the next stage of their venture. 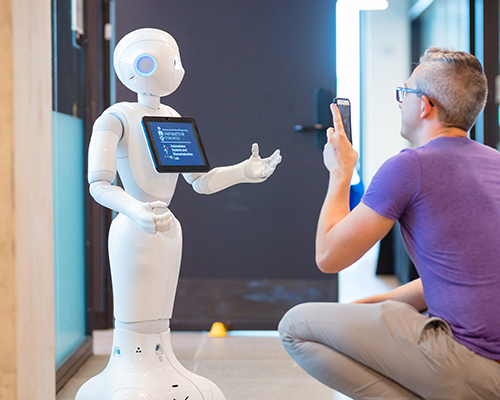 Visitors to the Norris Walker 5T7 Robotics Laboratory on Level 5 interacted with the latest robots developed through the Institute for Robotics & Mechatronics (IRM). 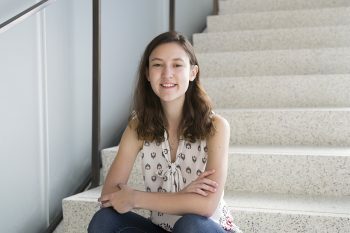 These included autonomous vehicles, medical and health-care robots such as Pepper and Tangy, microscopic robots for less-invasive surgical procedures, as well as platforms for exploration, mapping and manufacturing. How do entrepreneurs ideate before planting the seeds of a startup? 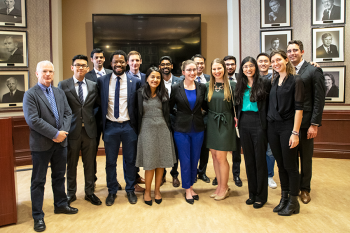 Attendees explored the approaches at The Entrepreneurship Hatchery’s Idea Market, a forum discussing real challenges and what it takes to address them from an entrepreneurial perspective. What is your Engineering Leadership Style? 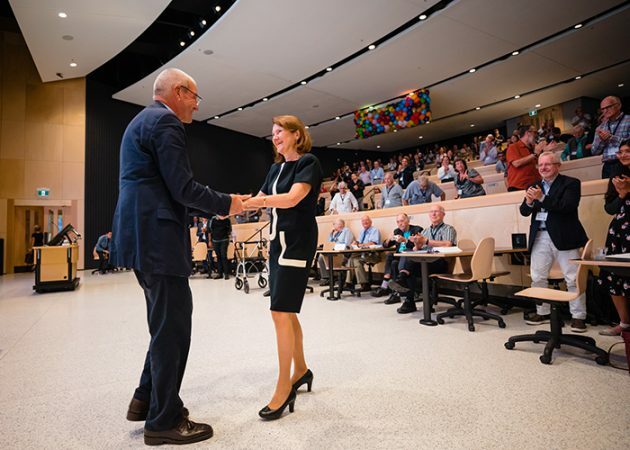 Visitors participated in a leadership quiz that allowed them to gain a better understanding of their personal leadership styles – from technical master, to organizational innovator. 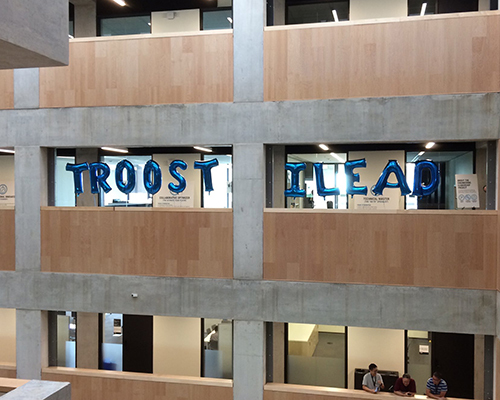 The eighth floor of the Myhal Centre was completely transformed into a fun lounge area where guests were invited to network over a game of foosball, relax with some snacks and enjoy the incredible views of the University of Toronto’s iconic Front Campus from the Dr. Woo Hon Fai Innovation Floor and Terrace.